Julie Gragg got her musical start in the Michigan public school system early in life. Inspired by her school musical experiences and band director, she went on to receive a Bachelor of Music from Western Michigan University in Kalamazoo in 1988. Her studies continued at VanderCook College of Music in Chicago where she attained a Masters of Music Education with an emphasis in instrumental music. The first downbeat of Julie’s teaching career occurred in 1989 at the Montessori and Kazoo Schools in Kalamazoo, Michigan as a part-time music teacher for pre-school to grade 8. In 1990, she moved to Kingman, Arizona taking on the position of general music teacher at Palo Christi Elementary. Since her entrance into the Kingman Unified School District #20, Julie has taught band, choir and general music at the elementary and junior high levels at several Kingman public schools. Julie currently serves as the district’s Music Coordinator and teaches band at Kingman Middle and Cerbat Elementary Schools. Her middle school band program routinely receives ratings of Superior and Excellent at Arizona Music Educators Association’s large group and small ensemble festival competitions. Julie has also taught music classes at Mohave Community College. Striving for excellence within her profession, Julie has received various teaching accolades and served on many regional & state music committees. She is the 2005 recipient of the Kingman Middle School Teacher of the Year and awarded Outstanding Community Educator in 2009 by the Kingman Rotary. Julie was a contributing member of the 2006 Arizona Department of Education’s Revision Committee for the state’s music standards. From 2007 to 2011, Julie fulfilled the role of Member-at-Large on the Arizona Music Educator Association’s Board of Directors where she was a driving force in the state’s movement to advocate for sustaining music programs in Arizona schools despite difficult financial times. She also organizes and adjudicates local & regional music festivals for Arizona school musicians. Art Swanson is a California native from Lompoc. He received his Bachelors in Music from the University of the Pacific and his Masters in Performance from Catholic University in Washington, DC. 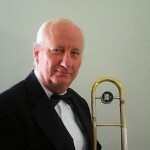 A member of the U.S. Navy Band in Washington, DC for 26 years, he performed as a trombonist and soloist with the Concert Band, led the Brass Quintet and served as the National Tour Director for six performing units. In 1975-1976 he toured with the Armed Forces Bicentennial Band where he met his wife, Ingrid, a horn instrumentalist. He has performed in every state in the country on national tours as well as numerous performances in the Washington, DC area. As a freelance musician, he has performed with musicians from the National Symphony, the Baltimore Symphany and the Fairfax Symphony. He performed regularly in the Washington, DC/Baltimore area in local orchestras, dance bands, brass ensembles and recording studios. After retiring from the Navy in 1996, he moved to Kingman to teach music on the Hualapai Reservation in Peach Springs. He also has taught band for the Mohave Community College and is conductor of both the Kingman Concert Band and the Mohave Community Orchestra.